You must be a member of the London Countryside Group to attend this activity. Would you like to join this group? You haven't seen London if you haven't walked along the canals. Join this Sunday adventurous walk – English weather forecast promises no rain! - Meet at Limehouse DLR Station and head to Limehouse Basin - once the principal point of access to the Thames for the entire national canal network. 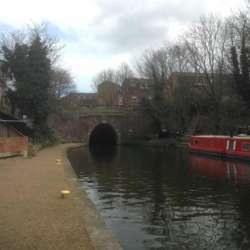 - near Angel canal disappears into Islington tunnel. We will walk via Chapel Market Protected content and we will join footpath after it. (Take cash if you wish to buy something in the market.) If anyone For anyone wishes to finish walk – there is Angel tube station. - we will walk along St Pancras and King's Cross to our destination – Camden Town. In Camden Town canal walk finishes. - We are planning to have a well deserved drink (and food) at the area pub in Camden Town. -Appropriate walking clothes and comfortable footwear (ideally hiking boots). -Waterproof and windproof jacket (depends on weather). -Sun cream and sun hat (if required). -Drinking water. We are planning to have a lunch in a pub. -Personal first aid kit and medication (if required). 3) Please note that walking carries a risk of injury. When you RSVP, you confirm that you are in good health, perfectly fit, can keep up a good pace and accept this risk. Please do not RSVP if you are unfit. 4) Please note that on walks, toilets are not always available, so when we need to, we might have to go in the bushes. 6) Please bear in mind this is a free of charge. It is not organized by a business nor any entity with commercial purposes. Trip details, travel advice, route planning, instructions and other content merely represent my personal knowledge, research and suggestions.